Specially Formulated Polypropylene, is certified Rnase-free, Dnase-free, Pyrogen-free, and DNA-free. Designed for storage of biological material, human or animal cells, at temperatures as low as -190°C. The cap features a long skirt for one hand aseptic technique. A super fast thread design that allows tightening or removal with a mere 1¼" turn, and an inside thread design that will not contribute to possible contamination. 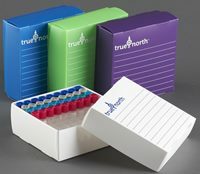 Tubes are provided with white marking area for sample identification, and can be color-coded by the use of a CAPINSERT®. 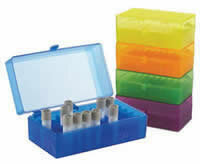 These CRYOVIALS® are compatible with most storage systems. Vials are sterilized by gamma irradiation, and are packaged in unique tempered-proof, resealable, safety-lock-bags of 100/pack or a case of 10x100 packs. The closures and tubes are both manufactured of polypropylene having the same coefficient of expansion, which further enhances the leak-proof qualities of these vials at changing temperatures. Cat. # Series # Vol. Made from polypropylene. 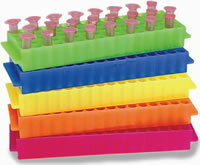 Color-coded inserts fit precisely into the cap of the CRYOVIAL® above for color identification. CapInsert® are sold 500 per bag. A wide mouth vial with 15 ml capacity. Useful for the storage and retrieval of solid specimens, such as bone, tumor, and organ samples. Made from polypropylene with high-density polyethylene screw closures. Selfstanding. Radiation sterilized, noncytotoxic, non-pyrogenic. Caps are attached in 15 bags of 5 vials each or 75 per case. 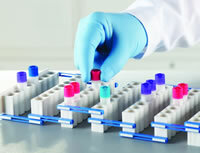 CRYO-LOK vials are ideal for storage or transport of material of extremely low temperatures. The vials have external threads, providing a smooth and uniform inner surface. This eliminates the problem of air born contamination and/or sample loss so common when vials with internal threads are used. The screw top incorporates a molded-in sealing ring, which assures a tight leak-proof seal. *Cap color Red, Yellow, Orange and Green are available upon request. The CryoELITE Tissue Vial is designed specifically for tissue collection, transport, and storage, to provide the utmost protection for those who value sample integrity. The CryoELITE Tissue Vials feature a wide-mouth opening, 5ml capacity and high integrity closure. 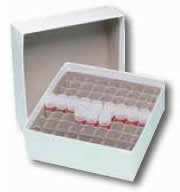 Tissue specimens have particular requirements for cryogenic storage. The CryoELITE Tissue Vial offers researchers who work with tissue samples ease of use, convenience and security. They are manufactured from low binding, cryogenic-grade virgin polypropylene that meets the USP Class VI classification and certified to be free of pyrogens, RNase / DNase and endotoxins, with a storage temperature range of -196°C to +121°C. The externally threaded cap provides a seal that exceeds DOT and IATA classifications for diagnostic specimens and are capable of maintaining asecure closure during freeze/thaw procedures during transport. They have a flat bottom and a stippled external surface to promote easier handling. Sterile. Same vial as above, with 2D Data Matrix Bar Code Insert. Provides unique identifier for traceability. 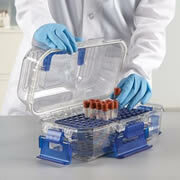 The new CoolCaddy™ keeps your reagents and samples cool, on the lab bench, without using crushed ice. Simply store your CoolCaddy overnight in any standard freezer and it’s ready to hold temperature between 2° and 4°C for up to 5 hours. Vials, tubes, plates, strips and multi-channel reservoir solutions can all be kept cool while you perform your experiments. 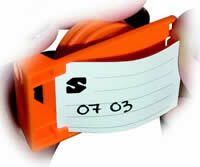 This optional 2D Data Matrix Bar Code Insert allows for immediate bar coding of your samples. The insert can also be applied to the vial at a future date, which eliminates jeopardizing the integrity of your sample by transferring it to another vial. Made from durable polycarbonate. Its unique design with slotted cavities accepts vials with slotted skirts. When placed in the holes the vials become locked in position, enabling the user to attach or remove the cap with one hand. 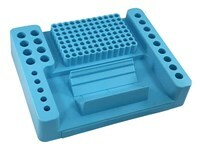 It accommodates up to 50 vials (½" or 12.7mm diameter) in a 5x10 array with alphanumeric indexing. Autoclavable at 121°C. The CryoSette is designed for frozen tissue collection, transport and storage. It can also be used for storing a multitude of other specimens in all laboratories. The robust design of the cryosette ensures that tissue morphology will be well preserved. This 2.5 ml container features a wide-mouth opening and a high integrity screw closure. It is designed with a flat bottom and straight sides for easy tissue removal. The specific shape of the Cryosette allows its manipulation to be optimized, whether you are using gloves or not. The CryoSette efficiently stores tissue samples in -86°C ULT freezers or in the gas phase of liquid nitrogen in Dewar flasks at -196°C, but not in LN2 liquid phase. The CryoSette screw closure and base are designed so they will not seize at low temperatures. Rapid visual 1¼ turn, even during repeated freeze/thaw cycles. The CryoSette offers two surfaces for handwriting or applying labels: an anterior surface and a larger space underneath the base. A thin cardboard I.D. label and a plastic transparent cover are available for the latter. The anterior writing surface is improved for ink adherence. This storage rack is designed to contain 21 frozen tissue Cryosette containers. The box is compact and has an SBS standard footprint to make suitable to several robotic storage systems. These innovative boxes can be stored in low-temperature freezers. Temperature range: -196°C to 121°C. Suitable for cryogenic storage, but only in gas phase of liquid nitrogen. This CryoSette storage box can accommodate up to 40 Tissue Storage Containers in a space as small as 133 x 133 x 52 mm H.
Made of extra strong polycarbonate, this durable cryogenic storage box is designed to be used at temperatures between -196°C and +121°C and are autoclavable at 120°C, 15 psig (1 bar) for 20 minutes. Only in gas phase of LN2. The frosted cover allows the user to write directly on top of the box, and is keyed to the base to prevent misalignment. 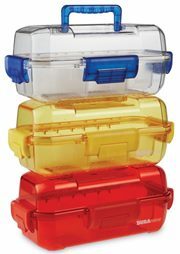 Made from strong Polycarbonate, these durable cryogenic storage boxes are designed to be used at temperatures between -190°C and +121°C and are auto-clavable. Different models are available to accommodate tubes from 1ml to 5 ml. A transparent cover allows the user to see the contents of the box, and is keyed to the base to prevent misalignment. Being printed with a series of squares (numbered from 1 to 81, or from 1 to 100), the surface accepts writing with markers for better inventory control. A unique color-coding system uses color plastic grids inserted to separate the cover from the base of the 81-place box. Boxes are made to accept 100 tubes have a colored base instead of grid. A choice of four popular colors is available: blue, green, red and yellow. 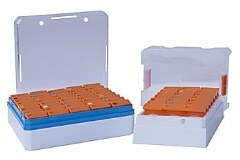 Removal of vials is facilitated by an innovative tool called the Vial Picker, which is supplied with each storage box. Made from heavy-duty chipboard. These boxes store vials neatly and fit most standard rack systems. They come with dividers and are slotted for cross-ventilation. The small box is 5½" (132 mm) square, 2" (50 mm) high and contains divided spaces for up to 81 2 ml vials. Hospitals, field hospitals, sea ports, airports, clinical and research laboratories worldwide are experiencing a heightened focus on disease control. Help these establishments safely handle, store and transport potentially infectious specimens within the facility with the DuraPorter®. The DuraPorter® is an easy-to-load, durable, waterproof, and leak-proof container that securely locks for transport. Available in clear, translucent yellow and translucent red, the DuraPorter® provides visibility for content identification and protection during sample transport. The entire unit can be placed in a freezer or refrigerator if the enclosed samples need to be kept chilled. Included separators can also be used to create inner compartments. 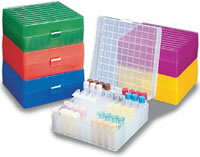 Or, use without racks or separators as one large storage space for larger samples or supplies. Economical storage solutions in a box. Store cryogenic vials in liquid nitrogen, or in mechanical freezers in our freezer storage boxes. Box footprint is 133 x 133 mm. Select a box and a partition that fit the size and number of vials for your needs. Colored cardboard boxes are ideal for identification and sorting purposes. Choose blue, red, yellow or assorted pack (four each of blue, red, and yellow). Organize – Easily view, organize and track up to 46 tubes including 24 tubes 0.5 to 2.0 ml, 14 tubes 13 ml, 7 tubes 15 ml, and 1 tube 50 ml. Freezable – Turn the rack over and fill with water for freezing. 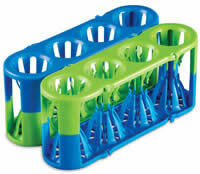 A non-slip rubber bottom (included with each NovaChamber) keeps the water/ice contained for a portable ice chamber rack. Molded numbers - For easy sample tracking, each rack has molded numbers. Reduce sample handling time and the need for several racks when working with samples for cold temperature storage with the Work2Store expanding storage rack. The opening and closing mechanism allows the rack to expand, creating needed room for sample manipulation. Then simply collapse the rack back to its compact form and it is ready for the freezer. Temperature range -80 to 121°C. Connect up to 4 interlocking racks. Twist and turn to suit your application! Rotate each of the four modules independently. Use several sizes of test tubes, culture tubes, centrifuge tubes, or microcentrifuge tubes at the same time. Click each module into place, load with tubes, and carry! 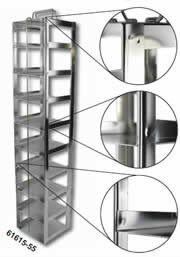 Rack maintains its orientation until you twist it again. Comes fully assembled. Autoclavable. Each module of the Rota-Rack for large tubes holds nine 50 ml tubes, eight 15 ml tubes, six 20 mm tubes, or ten 10-13 mm tubes. 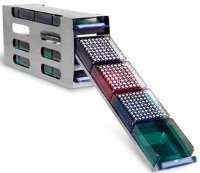 Each module of the Rota Rack for microtubes holds six 15 ml tubes, nine 1.5/2.0 ml tubes, twelve 0.5/0.6 ml tubes, or thirty-two 0.2 ml PCR* tubes or four 8-tube strips. Create as large a rack as you need by linking together multiple racks. Heavy-duty polypropylene racks feature a unique system of tabs and slots, that facilitate easy connection and sturdy fit. Autoclavable. Assorted colors or natural. Designed to fit in a standard 2" freezer rack, this 144-place PCR Tube Freezer Box will hold individual and/or strip 0.2ml PCR tubes. Popular fraction-collector-plate style rack. Rack holds 1.5 to 2.0 ml microtubes in a 5 x 16 array. Tubes sit in large wells with conical bottoms. Polypropylene rack is ideal for freezer storage. Autoclavable. Rack measures 229 x 67 x 28 mm. With an easy open, friction fit lid, these boxes are safe for low temperature storage. Designed for quick visual identification, the uniform wells have a location ID and the tube capacity indicated on the outside of the box. They are debossed with a distinctive wave design and are autoclavable. Available in 7 colors or an assorted pack, with a frosted labeling area. A black light tight version is available for light sensitive samples. This PCR storage rack is packed full of features. The sleek and modern patent pending design offers a unique lid from which the rack slides out and then rotates 180° to become a convenient stand. Ergonomic textured finger grips provide a secure hold, reducing the chance of dropping the PCR rack, making transportation easy, especially when using gloves. To ensure integrity, the translucent polycarbonate lid has a side opening for faster cooling of samples. 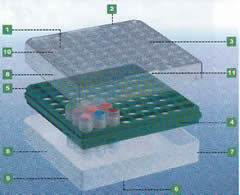 The base is made from robust ABS construction, with a closed base design to keep samples safe and cold longer. A location ID of numbers and letters allows for organized sample placement for easy and quick sample retrieval. The rack is versatile and can be used on a bench top or for freezer storage. 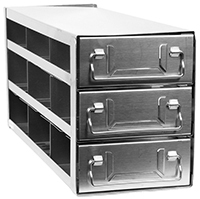 The compact footprint is stackable, which helps save valuable space in the lab. Available in multiple colors for coding options. 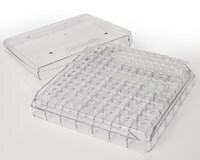 Polypropylene rack has 96 wells to accommodate 0.5 ml micro centrifuge tubes on one side, or 96 wells for 1.5 to 2.0 ml micro centrifuge tubes on the other side. Arranged in standard 8 x 12 array. Handy lid snaps into place in the tabs on each end of rack. Grid lines are molded on the side of the rack that accommodates the smaller tubes making it easier to see the wells. Raised rings are molded on the opposite side of the rack making it easier to replace the 1.5 to 2.0 ml tubes from those wells. Rack measures 246 x 121 x 50 mm. Polypropylene rack features durable three point hinges and clasp for secure lid closure. 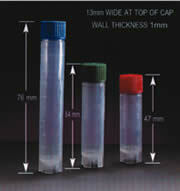 Holds 1.5 to 2.0 ml microtubes and cryovials. User friendly rack features molded gridlines on the lid, imprinted coordinates on the bottom of base, and imprinted and raised coordinates on the box. Rack measures 141 x 149 x 54 mm.